Accrington Stanley v Newcastle – Carling Cup match preview. | NUFC Blog. Accrington Stanley v Newcastle – Carling Cup match preview. The Crown Ground - A real football ground. Newcastle take on Accrington Stanley tonight in the 2nd round of the Carling Cup. A largely second string side will be charged with trying to help us get past this potential banana skin of a tie, and Sky TV, who will be broadcasting the game live, will no doubt be waiting for and willing for an upset. The match will give some our brightest young talent, such as Haris Vuckic, the chance to show everyone what they are made of. If things do start to go wrong and Newcastle need to dig themselves out of a hole though then there will be a number of senior players, like Kevin Nolan, who will more than likely be on the bench to try and dig us out and avoid an upset. Trying to guess the team is going to be a bit difficult as I just don’t know how many of our young players are going to play. The key is balance, playing enough of the kids but not too many of them at the same time like we had last season at Peterborough. We know we are without Sol Campbell, Danny Guthrie, Danny Simpson, Xisco, Dan Gosling and Steven Taylor so they can be ruled out. With that in mind I would like to se a team of. Newcastle – Krul, R Taylor, Tavernier, Coloccini, Kadar, Lua Lua, Smith, Nolan, Vuckic, Ranger, Lovenkrands. That team will give us a mixture of youth and experience down the spine of the team. Left back is a problem as I don’t like Kadar playing there, but needs must I would say, and there is a need to rest and protect Jose Enrique. As for Accrington, they will no doubt be up for this. The chance for them to beat the name of Newcastle United – a Premier League team – doesn’t come along too often and they will want to give a good account of themselves in front of the TV cameras. There is no doubt this game has the words ‘banana skin’ written all over it for us. Accrington are in a situation where nobody expects them to win, but if they do then it will be a massive bosst for them, for more than just financial reasons. Newcastle must remain professional and ensure they avoid a slip up this evening. Date – Wednesday, 25th August, 2010. Venue – The Crown Ground, Accrington. 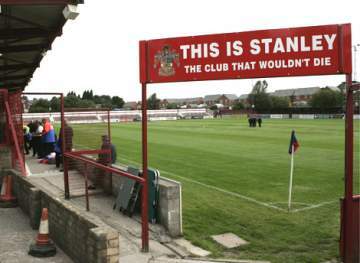 Accrington Stanley v Newcastle – Match banter. Do y’not think Perch’ll play? & Guthrie may get a game if fit. Breaking news on SSN: S Taylor placed on transfer list! So he wants too big a contract? Who’s going to buy him? He’s out injured for a few months and he’s out of contract next summer so can’t clubs offer him a deal in Jan? Kadar is injured, and anyway why don’t you like Kadar playing their, he’s a good LB, please elaborate? I think Hughton might give Dummett a shot at LB, I hope he doesnt lump some right footer out of position there. If Tavernier has earned the right to play right back then surely Paul Dummett has coz he’s a better player imo. Ferguson could play there also but I see him as more of a winger. As a matter of curiosity just who is S. Taylor, I seem to remember someone of a similar name a few seasons ago. Players come and go but the Steamboat Toon just keeps rolling along, we will lose betters players than him at some point in our future history. And, get better ones in. Probably see some tonight (playing for us that is).